Click on these pictures to view full screen versions! Artificial Horizon, Magnetic Compass, Direction Indicator, Altimeter, Air Speed indicator, Vertical Speed Indicator, Manifold Pressure, RPM, EGT, Intercom, Flaps Indicator, Vacuum Gauge, Generator Charge current, Dual Fuel Gauge, Oil pressure, Engine head temperature, Oil Temperature, VOR display indicator, ADF display indicator. Aircraft originally delivered to Gabon in 1964? with registration number TR-LKY. Has been owned by private syndicates of two or four partners since that time. Current owner who is selling share bought share in 1991 and been involved in the aircraft since that date. 1982 Forced landing Ladysmith - Aircraft out of action 5 months while repaired. Feb 2001 - Freak wind at Grand Central damages the hanger in which ZS-JVU was parked and damaging the aircraft. Wings removed and rejigged to manufacturers specifications and new upper skin replaced to remove all hail damage. Aircraft repainted. This aircraft typically flies about 100 hours per year. In the past few years, Cessna have started producing new 182s which have similar flying performance to ZS-JVU, newer instrumentation, but cost about R3 million to purchase. The 182 is a very strong workhorse and a very forgiving plane to fly, allowing landings on short dirt strips such as game parks. With its 235HP engine, it takes off over very short distances. Four partners with one pilot registered for each share. Hangerage and insurance costs about R750 per month per partner. One partner looks after booking book and bookings on a first come basis. One partner sends out the invoices for flying expenses each month, pays accounts and manages cheque account. EMPTY WEIGHT (Approximate) 1625 lbs. Standard Tanks 65 US gal. 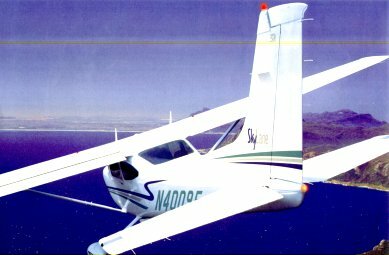 What does a brand new 2003 Skylane (182) look like that currently in production?